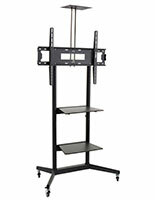 More Common Size & Color Options Available! 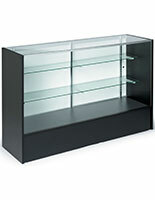 More Color & Shelf Width Options Available! 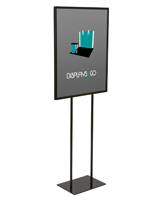 Want to spruce up a showroom, outfit an entire office building, or bust out with a new look at the next trade show … without straining the budget? 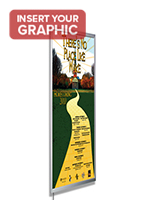 Discount merchandising displays are a great way to afford top-ticket cash wraps, retail furniture and signage without sacrificing quality. 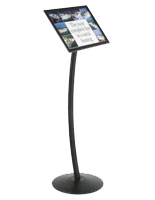 Statistics tell us that while shoppers favor online browsing, 80 percent of customers complete their purchasing pattern inside of a physical storefront. 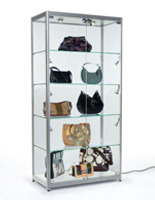 That’s a good reason to make sure your showroom stays on-trend and looking modern and polished. 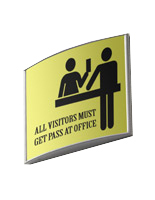 A commercial office or service area should also be up-to-date, with the proper placement of signs and card dispensers at key places to reinforce brand, and generate interest. 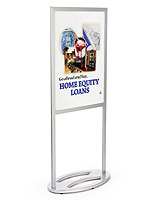 Consider shopping our discount merchandising displays for static and digital signage, retail furniture, trade show banners, and basic items like acrylic brochure racks and sign holders. 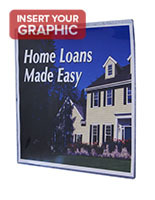 Got a full-scale renovation project on the back burner? 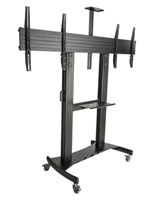 Take advantage of commercial-grade products on sale and push it to the front. 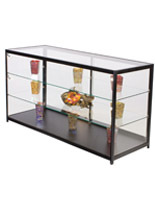 Our reduced items offer the same quality, just at a big savings to you. 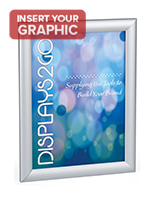 Due to the size of our business, your business gains access to a plethora of displays-in-stock that can be quick shipped to your door! 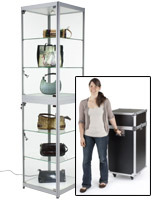 Some outfits have a sale and offer a few highlights that leave you disappointed when you find they don’t have it in the right size, color, or configuration. 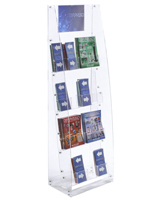 But our collection of discount merchandising displays are so vast, you’re bound to be able to complete your corporate build-out from A to Z using just our products on sale. 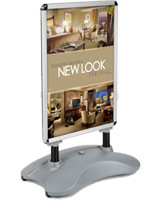 Which store fixtures at reduced prices are must-have that can help my business? 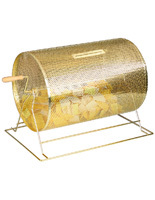 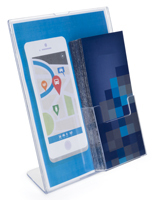 Discount merchandising displays -- our “bread and butter” brochure holders and greeting card racks – are the first step in any integrated marketing plan. 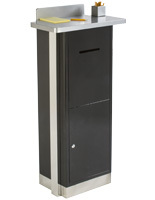 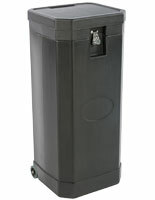 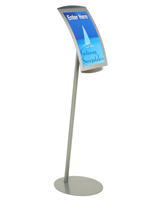 Available in every size and construction material, take-one business card dispensers keep customers in touch with you, and will generate more sales. 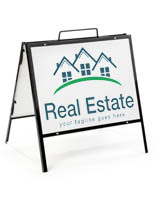 Sidewalk signs including A-frame signage are great for restaurants, bars, and retail stores. 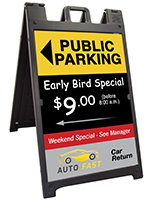 From chalkboard-style, to plastic with Coroplast inserts, our pavement signage can be used at events, outside of restaurants and retail shops. 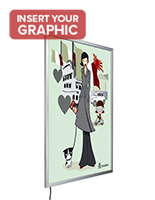 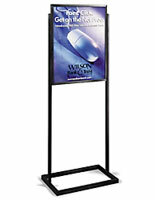 Sign frames for posters, prints and pictures come in myriad sizes for both retail store, advertising, and personal framing in offices and homes. 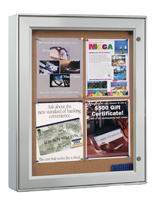 Available in acrylic, plastic, wood, and metal, as well as our sophisticated lightbox styles, framing is essential when spreading the word about your business. 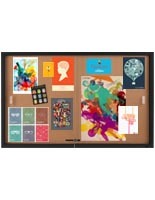 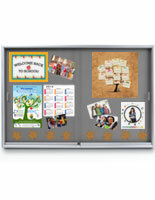 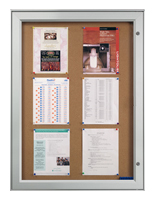 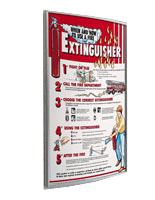 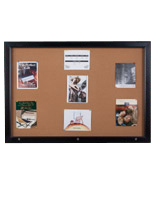 Bulletin Boards are used in schools, community and athletic centers, office buildings, and other commercial spaces where notices need to be updated frequently. 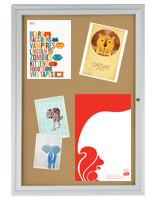 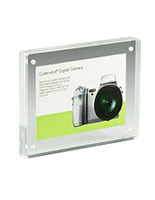 Fabric or cork backers provide decorative options, while some enclosures feature acrylic doors to keep contents safe. 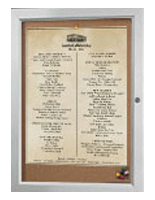 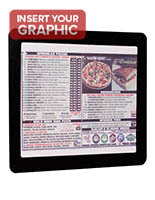 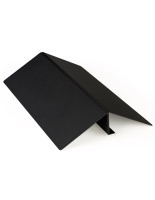 Menu stands with acrylic overlays can keep menus protected outside, drawing customers into your establishment. 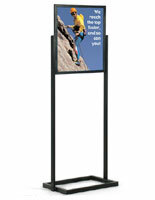 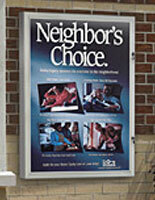 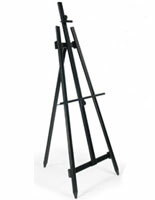 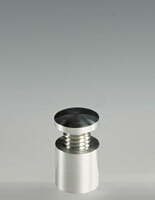 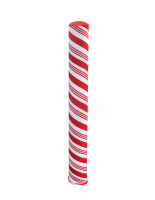 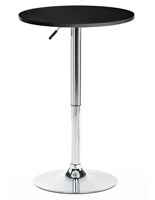 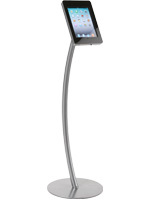 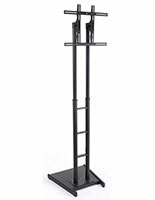 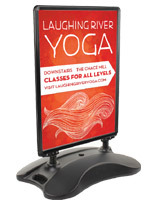 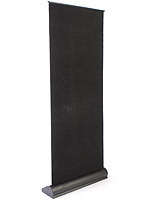 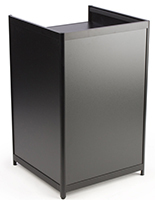 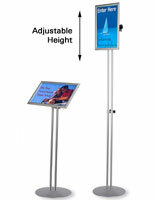 Usually in a pedestal design, these displays are the first point of contact between you and your customer. 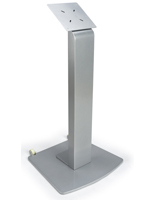 Podiums in acrylic, wood, and MDF offers a variety of price points and looks to suit any educational environment, hospital conference room, or church. 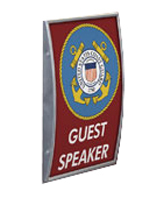 Custom graphics, or a plain front, are options as well as shelving configurations (or just a simple podium) that customers can choose from. 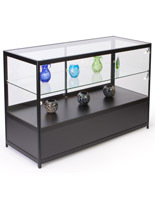 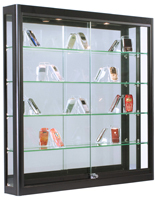 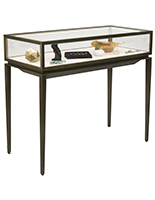 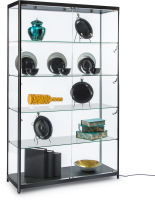 Display cases come in numerous styles from modern to traditional, lighted or not, with storage compartments or simple pedestals. 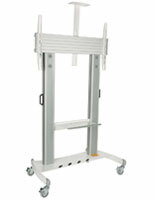 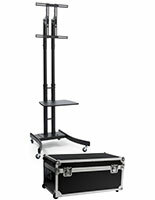 The showcase designs are limitless, and many are locking for safety and wheeled for mobility. 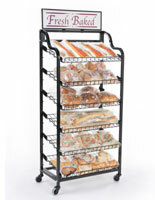 Wire bakery racks, basket style displays, and locking full-vision showcases among the different styles for different uses. 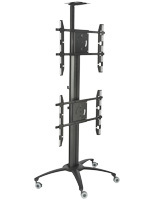 TV Stands are big-ticket items, and sales are a great way to afford them. 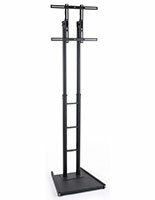 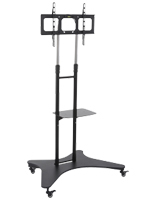 Whether television holders are used with a lecture in a boardroom, or as work stations in an office, monitor stands for up to 50 screens at a time can be expensive – so buy them cheap! 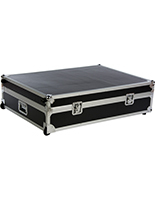 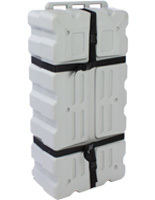 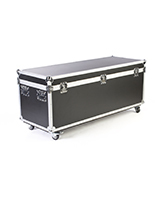 Carry cases with EVA foam padding are a great way to transport them. 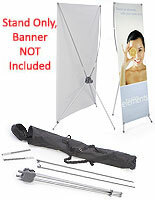 These are just some of our many products for sale. 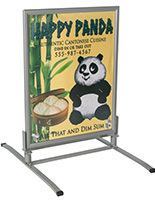 Whether you’re furnishing an elegant hotel, or placing promotional signage in a car dealership, our selection of sourced and imported products can be found here at deep discounts. 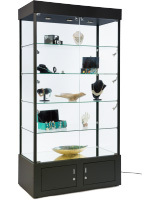 You’ll benefit from our 40 years of expertise in industry displays, plus our super-informed customer care team who will walk you through the purchasing process, and to supplement any instructions and videos, they are also a source for advice on how to use them. 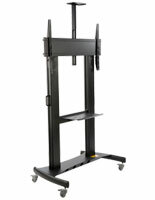 Not only that, enjoy quick-shipping on every piece of in-stock inventory. 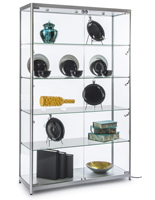 Our products on sale are no different than those you see in our everyday collection – they’re just cheaper! 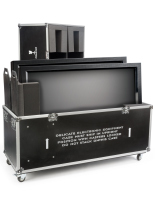 Take advantage of cutting edge technology blended with master fabrications that are built to last. 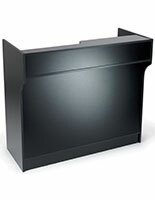 Don’t put off capital projects – shop our sales and make them happen! 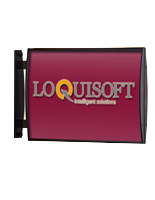 Kick up more conversions with savvy marketing tools that are top quality, for less. 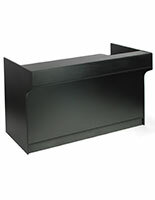 Don’t forget to check in regularly for future sales. 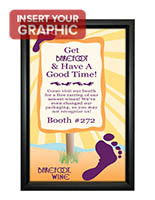 But if you see something today – jump in – because the sale won’t last forever!